Like most artists, I get a vision of something in my head and if it lingers long enough I put it on paper or canvas, something to bring it to life and share. Line, form, shape, becomes design and color – tangible. My view from inside comes out to meet the rest of the world. Why does one person consider a bird a symbol of inspiration? Of freedom? And, why does another consider it frightening or repellant, creepy? I find it interesting that we each have our own inner view point. Choreographer Twyla Tharp calls it our “creative DNA”. Each artist is drawn to a certain way of thinking, of creating, and perhaps a certain subject matter or color palette. We all bring our unique world view, biases, likes and dislikes to whatever we do. We can’t help it. We’re human. But an artist of any sort – writer, dancer, musician, or visual artist – helps us to see anew, see through their eyes, or at least filtered through their perception. We may be challenged by what we see or we may love it immediately. It’s good in any case. Imagination is a wonderful thing. Tea and I go way back. When I was little, my mom would have tea with her friends and they would chat and I got to tag along. Even as a child, I had tea too – in a china cup. Tea tastes better in a china cup or at least a special cup. Coffee and tea are for slowing time, energizing the mind, being in the now, and for being together. It can aid in opening the self to another person or a meditative opening the self to the self. Fixing a cup of tea when I get to the studio is a ritual I have that helps me settle in and get focused on the task at hand (sometimes I have inadvertently dipped a brush in the cup…oops!). 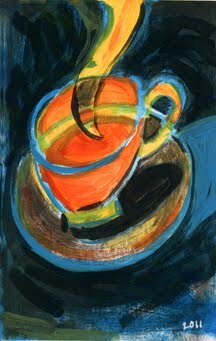 I like to draw and paint cups and their saucers. 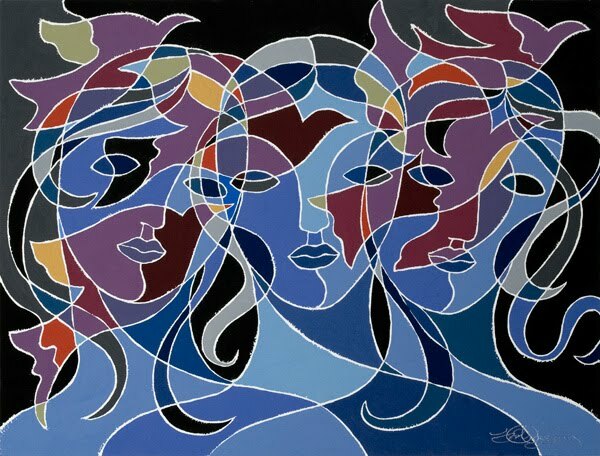 Their myriad shapes, colors and patterns are easily invented in my mind’s eye, a fantasy cup or perhaps a memory of one filtered through my imagination. 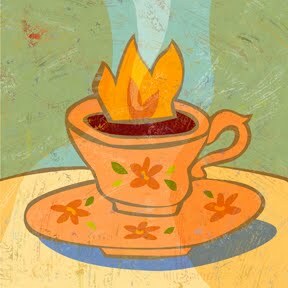 Above is one of my illustrations of a hot cup of tea. You are invited to join me here for tea each Tuesday.